I was recently looking through my hard drive and found old videos I had recorded for my business. Watching them made me cringe! 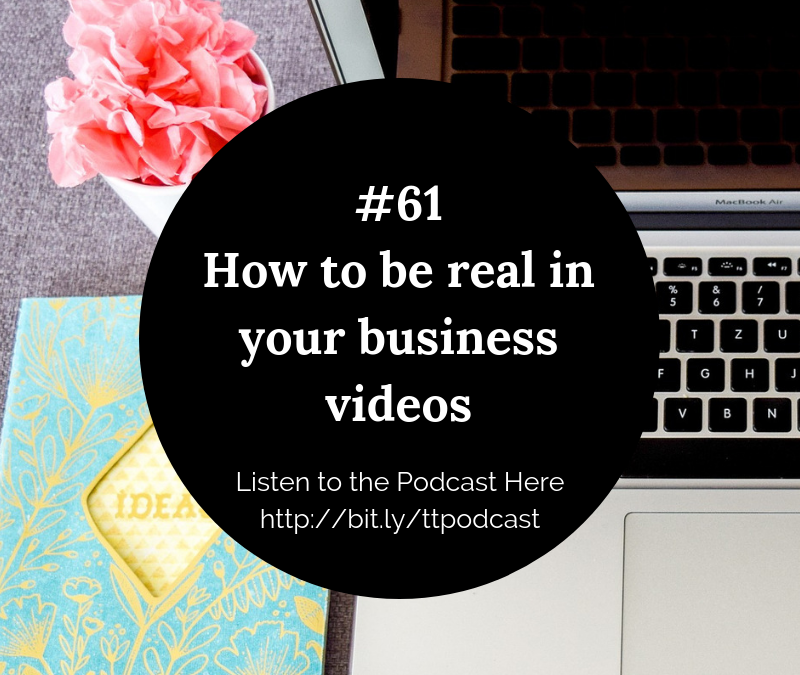 In this episode, I share what made me cringe and how to show the real and authentic you in your business videos! Hello lovely, and welcome to today’s episode. Today I wanted to talk to you about the importance of authenticity and being you in your business. But what does that really mean? I know, you’ve probably heard the word authentic being banded around so many times you’re sick of it. Because you don’t know what it really means or how it applies to you in your business. And the reason why I wanted to create this episode was because the other day, I was going through my hard drive, and I was looking at old videos that I had done for the business before Tiny Time Big Results was born in one of the previous incarnations of my business. And I have to say, I was cringing a lot, and I’m talking a lot, and the reason I was cringing was because of the way that I was coming across. It wasn’t necessarily about the content, it wasn’t necessarily about the words that I was using, but it was the way I was coming across. Now, first of all, I was wearing dresses, which I never do, I’m a girl who is forever in jeans and a top. I had makeup on, which I know I have makeup on today, but you’ll see there are loads of videos of me now where I just wear my glasses or I don’t have any makeup on at all. So I had dresses on, I had makeup done. And that was all fine, that’s all superficial stuff. What was really making me cringe was the fact that I was so stiff, and I was really conscious of what I was saying and how I was saying it. Could you imagine me breastfeeding in one of those videos? I don’t think so. I was not ready to do that at that stage! And it’s only over the years, as I’ve been doing more videos, as I’ve been working on my business and you know, what it is that I do and who I help, and as all of that has evolved over the years, the more I’ve allowed myself to come out into what I’m doing. Now I have a very simple strategy for my videos. I know the point that I want to get across and I might have some bullet points. And then after that, it’s pretty free-for-all, but I know the point that I want to get across, and I have my bullet points so that I’m not just rambling on, although it may feel like that sometimes! But the key thing here is about being relaxed in your own skin, and being relaxed, and allowing yourself to bubble up and bubble out and to be truly you. Let your quirks come out. If you’re a bit weird, then that’s fine. Us weirdos have to unite! And if, you know, there are things that you do, and it’s just part of you, I talk a lot with my hands, and I remember someone saying to me, “you need to stop doing that.” But that’s just me. And so I will carry on doing it, I apologise if it bothers you, but I will keep on doing it. Because it’s just me, it’s how I express myself. And the more that you can allow yourself to show up, and be who you are, and be fully you, people will either love it or they won’t, and that’s fine. Because you want to magnetise the right people and repel the people that just don’t fit in your world, who are not your ideal clients, who are not your tribe. We’re not everybody’s tribe and that is okay. There is a relief in that, there is such a relaxation in that because you don’t have to be all things to all people. And most importantly, you just have to be you, and the people who like you and get to know you and they get to trust you, they’re the ones that you’re gonna be spending the most time with anyway, so don’t be afraid of being who you are. You don’t have to get dolled up and you don’t have to have big glam dresses on or have your hair done, to do videos. I do videos sometimes in my kitchen, or I might do them in the car, and it’s about being natural, it’s about being relaxed, it’s about being you, and the odd time I’ll take a video when I’m at the school gates waiting for the kids. But that’s just me, that’s my daily routine. You know, you might be out in the garden or out walking, and you might be doing your Facebook Lives that way. It’s okay, it’s all okay. I think the most important thing is that you’re not trying to be like somebody else. You’re not trying to emulate someone else’s style and in turn, losing yourself. I think that’s really key. So that, for me, is what authenticity means. And I would love to hear what you think. Would you allow yourself, your little kooks and weird eccentricities and things to come out when you’re doing a video? I think you’ll be amazed and surprised at how much it helps people to see the real you, and then they know that you’re the real deal and you’re not just messing. I hope that helps you today. I look forward to seeing you the next time and don’t forget my new book is OUT NOW! You can get your copy now on Amazon and get some amazing bonus resources! Alright my lovely, that’s it for me for now, and I’ll talk to you next time. Bye!